HAWTHORN’s Jack Gunston and North Melbourne defender Robbie Tarrant should both be fit to play in their respective preliminary finals, leading medico Dr Peter Larkins says. However, Larkins said there was still enough doubt over the pair to suggest their clubs would make the call as late as possible. 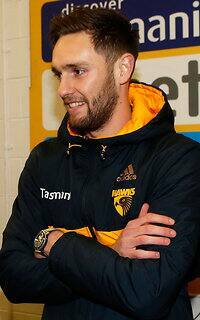 Gunston injured his ankle against West Coast in the Hawks’ qualifying final loss in Perth a fortnight ago and was held out of the weekend’s 74-point semi-final win over Adelaide. “He’s certainly going to be in the mix,” Larkins said of Gunston’s chances of playing. “He’s only missed one game, which is a bit unusual with that syndesmosis ankle injury. “With the strapping and a bit of extra time, he should be right to play. Tarrant was a late withdrawal from Saturday’s semi-final against the Sydney Swans with a groin strain, pulling out just 10 minutes before the start of the game. The North defender was on light duties at training on Monday and Larkins said that would be a theme for Tarrant this week. “There’s still going to be a cloud over Tarrant,” Larkins said. “He probably has a small adductor tear which is the reason why he had to pull out. “It was on his kicking leg too, so that’s an issue for him. “If he doesn’t have a setback on it he should be right to play. But it’ll be playing on his mind and it’s certainly not an ideal thing to be going into the game with. North teammate Drew Petrie was not spotted out on the track on Monday and was instead completing his work indoors. But Larkins believes the knee injury he sustained against the Swans won’t hold him back. “He landed very awkwardly and had an impaction injury, so there’s more of a bruising situation inside the knee,” Larkins said. The Dockers are confident Nat Fyfe (lower leg stress reaction) will be right to go against the Hawks on Friday night. However, veteran defender Luke McPharlin has been ruled out because of a niggling calf injury. Fremantle has also floated the idea of bringing tagger Ryan Crowley back into the team, despite the fact he has hasn’t played at all this season due to a one-year ban for breaching the AFL’s anti-doping code. “It’s a massive call to play him in a final with all that’s on the line,” Larkins said of Crowley’s chances of playing against the Hawks. Larkins also expects star Eagles Matt Priddis (thigh) and Chris Masten (hamstring) to be fit for the game against the Roos. Priddis was a late withdrawal from the club’s qualifying final against the Hawks. Masten has not played since injuring his hamstring against St Kilda in round 23. “I would normally expect them to give him an extra week if it wasn’t a knockout game,” Larkins said. – Hawthorn defender Brian Lake (abdomen) will receive some treatment this week but will be right to play against the Dockers. – Dockers defender Cameron Sutcliffe is still at risk of re-aggravating his pre-existing unstable shoulder injury but will be declared fit. – Eagles defender Jeremy McGovern would continue to be wary of stirring up his AC joint injury, but the Eagles will ensure he doesn’t start the match sore.